During a ceremony on April 20, construction crews celebrated the topping out milestone, which signals the completion of the final level of the facility’s steel structure. 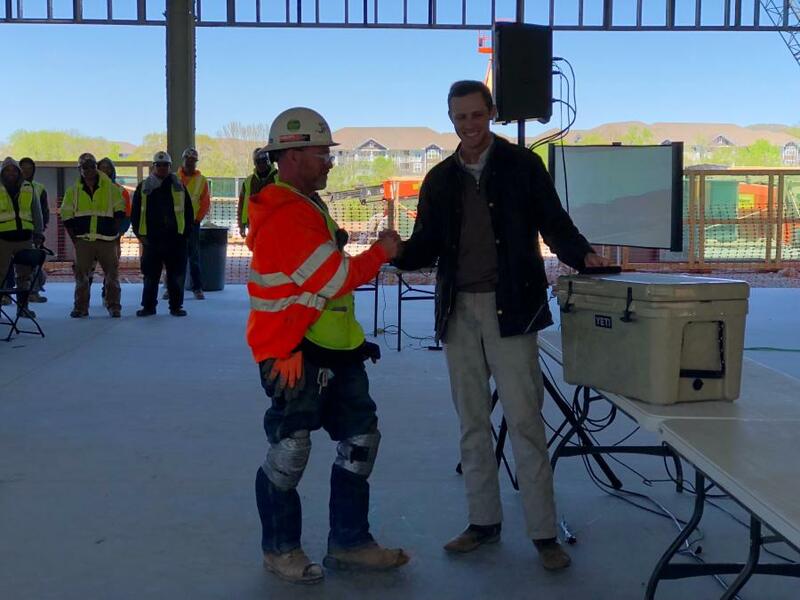 General contractor Brasfield & Gorrie recently joined Highwoods Properties to mark a milestone in the construction of a new headquarters facility in the Ovation mixed-use development within the Cool Springs district of Franklin, Tenn. The facility will serve as the new U.S. headquarters of Mars Petcare. During a ceremony on April 20, construction crews celebrated the topping out milestone, which signals the completion of the final level of the facility's steel structure. With two connected buildings and a seven-level parking garage, the new headquarters will include approximately 223,700 sq. ft. of office space that will provide pet-friendly and collaborative areas for employees. Designed and constructed with sustainability in mind, the facility is pursuing LEED Gold certification. Serving as construction manager-at-risk, Brasfield & Gorrie is teaming with Hastings Architecture Associates on this project, which is slated for completion in 2019.